Cambria, California, has a lot going for it in addition to being the closest town to Hearst Castle in beauitful Big Sur. It’s home to artists and artisans, drawn to the bohemian lifestyle the town offers. On a recent visit in October, with Halloween just around the corner, these creative types went to work building whimsical people and creatures from paper mache and other materials. 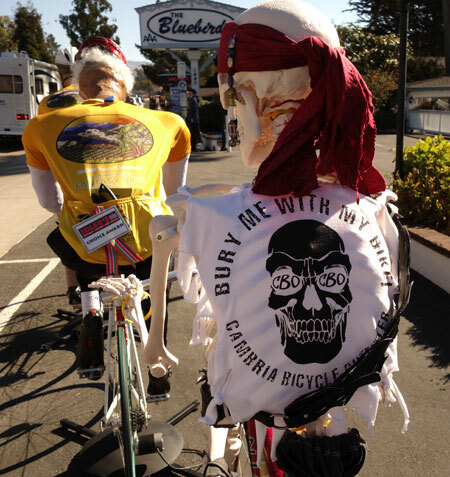 Leave it to Cambria Bicycle Outfitter to come up with a creative display that, in my humble opinion, tops the rest. We have skeletons, Snoopy, surfers and more pedaling away under the morning sun. Enjoy. It says “Bury me with my bike,” a sentiment shared by many a cyclist. Seen in Cambria, California. This entry was posted on October 18, 2012 at 7:43 pm and is filed under News. You can follow any responses to this entry through the RSS 2.0 feed. You can leave a response, or trackback from your own site.